Life during the Indian Wars Time Period was hard and often just boring. The earliest settlements of westward expansion were the forts. They were centers of trade and commerce and brought growth, stability, and trade. 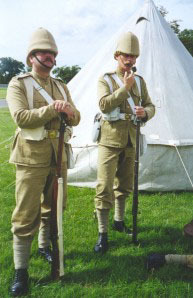 The soldiers helped to build roads and later string telegraph lines. The Indian Wars of the 1870's-1890's saw the Army involved in a long series of smaller engagements. These wars often consisted of numerous scattered skirmishes over wide areas, without any substantial battle being fought to determine the war's end. This type of warfare led to the further enhancement of the Non-commissioned Officer's [NCO's] role as small unit leader. Often fighting in small detachments, troops relied heavily on the knowledge and abilities of NCOs. The Army during the Indian wars was habitually unable to balance resources with requirements, both because of limited manpower and because of the continental size of the theater of operations. As Lt. Gen. William T. Sherman, commanding the Division of the Missouri, put it, "Were I or the department commanders to send guards to every point where they are clamored for, we would need alone on the plains a hundred thousand men, mostly of cavalry. 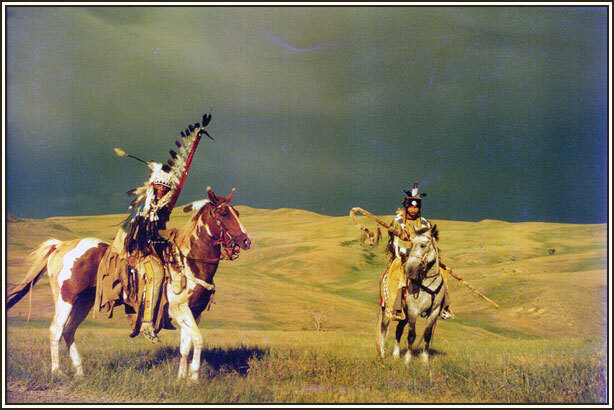 Each spot of every road, and each little settlement along five thousand miles of frontier, wants its regiment of cavalry or infantry to protect it against the combined power of all the Indians, because of the bare possibility of their being attacked by the combined force of all the Indians." A soldier's life was not glamorous, perhaps a fact learned too late after men enlisted. Some men romanticized the life while others wished to escape from a lackluster career or an unhappy home life. Other soldiers came to the West from the Civil War battlefields. Many were recent European immigrants,and after the Civil War, former slaves. A soldier's life would entail wearing wool uniforms and living in crowded, unsanitary barracks. Often the men had only beef, beans, stew, or bacon to eat. They averaged around $13.00 per month in wages. During the Indian Wars period, enlisted men lived in Spartan barracks, with corporals and privates in one large room. Sergeants were separated from their men, in small cubicles of their own adjacent to the men's sleeping quarters. This gave enlisted men a sense of comradeship, but allowed little privacy. The soldier of this period spent much of his time engaged in manual labor. Soldiers in the west were called upon to build or repair housing and fortifications, repair roads and bridges, serve as blacksmiths or bakers, perform guard duty, and other tasks. It was a hard life, pay was poor, and desertion was common. NCO's were fully tested in their abilities to maintain effective fighting units. Black soldiers of this period were often referred to as Buffalo Soldiers. The units they served in were the 9th and 10th Cavalry and the 24th and 25th Infantry. These troops provided 20 years of continuous frontier service. They campaigned in the Southern Plains, in West Texas, in the Apache lands, and against the Sioux. During the 1870's the Army discouraged enlisted men from marrying. Regulations limited the number of married enlisted men in the Army and required special permission to be obtained if a man in the Army wished to marry. Those men who did marry without permission could be charged with insubordination. They could not live in post housing or receive other entitlements. Still, nature proved stronger than Army desires or regulations. Marriages occurred and posts were transformed into communities. Married NCO wives had a hard life, often working as laundresses or maids. Their meals consisted of beans, bacon, beef and hardtack, with eggs, sugar and other staples being too high-priced for their budgets. Many lived in dugouts, sod huts or adobe buildings. The luckier wives lived in wooden structures or stone buildings. 1st US Cavalry, Company K This reenactment group reenacts Dragoon, Civil War, Indian War, and WWI eras. 5th US Cavalry, Company A The 5th U.S. Cavalry (Reorganized), Company 'A' and Camp Follower groups portray the soldiers, families and other Army post occupants during the Indian Wars Period in America (1868-1880 primarily). The Anglo Boer War, fought between the Afrikaaners and English Colonialists in South Africa in 1899 marked, among other things, the first appearance of concentration camps in warfare. Milner and his generals were characteristically optimistic but they soon learned they were in for a protracted and bloody conflict. Military disasters abounded and 22,000 men were killed in the initial stages. 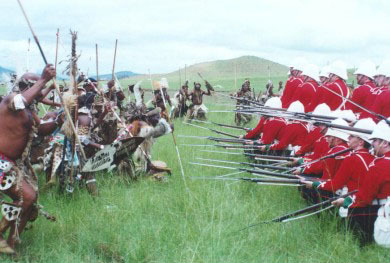 The Anglo-Boer War was a period of sustained violence. For nearly three years the British exercised a scorched-earth policy that left the country in ruins. The Boer republics knew they stood in Britain's way and citing the strategy that 'the key to a good defense is a good offense' struck first. In 1899 a Boer population of less than 100,000 farmers attacked British cities in South Africa and proceeded to hold at bay a British army of 450,000 for a further two years. The Empire was internationally humiliated. One historian describes the war as "Britain's Vietnam." The Boers invaded Natal and Cape Province and quickly captured the towns of Ladysmith, Mafeking, and Kimberly. The British abandoned their original plans in an effort to take back these towns. The British finally managed to recapture the capital cities of the two Boer republics in mid 1900. Some Boer commando units fled into the vast bush country and continued to wage unconventional guerrilla warfare by blowing up trains and ambushing British troops for the next two years. The British proceeded to burn farms and confiscate foodstuffs to prevent them falling into Boer hands. They packed off Boer women and children to concentration camps where many of them died from disease, or went to endure the exposure of commando life. The British literally starved the commandos into submission. African ex-miners and farm laborers were also concentrated in camps, and drawn into labor tasks by the British Army. Boers even raided the African reserves for food while Africans reasserted control over land and livestock previously taken by Boers, and on rare occasions attacked Boer commandos. 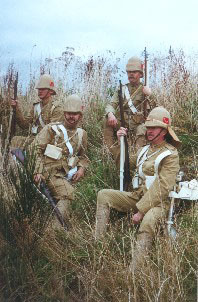 The last of the Boer commandos, left without food, clothing, ammunition or hope, reluctantly accepted peace terms from the British in May 1902 in the Treaty of Vereeniging. The Boers certainly won the peace if not the war. The Anglo-Boer War left a legacy of painful memories and mutual hatred. The British incarceration of Boer women and children in concentration camps left a bitter taste in the mouths of the Boers and lessened respect for the British Empire abroad. Though the intent of the British to halt the Boer guerrilla fighters who lived off the land and used their farmsteads as bases was militarily sound, the concentration camp conditions were so poor that almost 28,000 Boers died from starvation and disease. This alone was almost 10 per cent of the total Boer population. Many Afrikaners believed, that the British had embarked on a deliberate policy of genocide. The camps were a national tragedy harboring and enduring animosity and bitterness that lasted well beyond the war itself. Wow, there's a lot of history in this small time period. 30 years and yet SO MUCH happened that shaped our "modern" world.This section of reenactor.Net is intended to help support those worldwide living history groups who reenact and portray the time period of the 1865-1900-era ? regardless of nationality, era, or location of the unit. Many of these wars and "conflicts" are not heavily reenacted, but for those who are interested in these areas of history, they put a lot of "love" and time and yes, money, into their impressions. And yes, as time goes on, often things will pick up and more will come out and join you. If you are interested in one of these areas, check out the groups listed. This time period was one of great changes in the military and life. Life was harder, pay was lower. 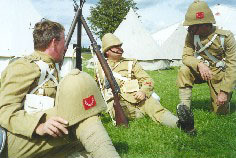 There was a huge variance in uniforms and weapons. There are as many possibilities in reenacting this period, as there are many different and important events and conflicts that occurred during these important 30 years.